Fukui in Echinzen Province (present a part of Fukui Prefecture) prospered as a castle town of Matsudaira Domain which yields 300 thousand koku of rice. The Kinai, the Myochin and the Akao schools are well-known in this area. Above all, the Kinai is the most famous. His common name was Gonbei. It is speculated that his surname was Ishikawa at first, however, he changed his surname to Takahashi later. 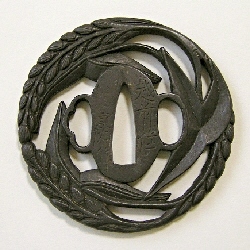 It is also believed that he came to Fukui during the Kanei era (1624 - 1644) of the Edo period from Ohmi Province (present Shiga Prefecture) because there is a Tsuba with the inscription "Ohmi Province, Kinai" in existence. The Kinai school prospered very much in this area. Their carving style was called "Kinai-Bori" or "Echizen-Bori". They were good at expressing dragons. Especially, the founder Kinai made several masterpieces whose motifs were dragons. Except dragon, he used a variety of subjects such as autumn grasses or Kiku flower and others. Although, he seldom picked up persons or landscapes as the subjects of his works. The Kinai family prospered with the Myochins and the Akaos together by intermarrying each other. Inscribed "Inhabitant of Echizen Province, Kinai"
Son of the founder Kinai. His common name is Gonbei (Same as the founder). He was good at expressing dragons or flowers and grasses in the Nikubori and the Sukashi methods on iron ground. His achievement to have brought the Kinai school into prominence is larger than the founder. He was buried in the grave of Seigen-Ji Temple located in Fukui.